The manure and urine of horses may be playing a bigger part in the pollution of waterways than many suspect, research suggests. 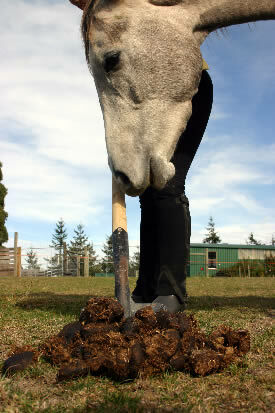 Scientists in Sweden carried out an investigation into the soils in two representative horse paddocks. They found that leaching loads of phosphorus and nitrogen from the paddock topsoils greatly exceeded average figures for Swedish agricultural land. The findings by the researchers from the Swedish University of Agricultural Sciences have been published in the Journal of Environmental Management. The Baltic Sea is one of the most eutrophied water bodies in northern Europe, with an abundant accumulation of nutrients that support a dense growth of algae and other organisms, which can deplete the shallow waters of oxygen in summer. More than half of the Baltic Sea’s total waterborne phosphorus and nitrogen loads from human activities derive from agricultural sources. Sweden is the second largest contributor of waterborne nitrogen and the third largest contributor of waterborne phosphorus to the Baltic Sea. Horse farms now occupy almost 10 percent of Swedish agricultural land, but were not well investigated with regard to their environmental impact, the researchers said. In the study, potential phosphorus, nitrogen and carbon leaching losses were measured from the two horse paddock topsoils to a depth of 20 centimetres. One paddock comprised mainly a clay soil and the other a loamy sand soil. The researchers carried out their measurements following simulated rainfall events in the laboratory. Results showed that the leachate concentrations and net release of phosphorus and nitrogen and dissolved organic carbon from paddock topsoils were highest in feeding and excretion areas and considerably higher from the loamy sand than the clay paddock topsoil. Leaching losses of dissolved reactive phosphorus were significantly correlated with concentrations of water-soluble phosphorus and ammonium acetate lactate-extractable phosphorus in the soil. Leaching losses of dissolved organic phosphorus and total organic nitrogen were significantly correlated with the dissolved organic carbon concentration in leachate, they found. “Leaching loads of phosphorus and nitrogen from paddock topsoils greatly exceeded average figures for Swedish agricultural topsoils,” they reported. Horse paddocks posed a potential threat to water quality through leaching of excess phosphorus and nitrogen, the researchers concluded. “Feeding and excretion areas are potential hotspots for highly enhanced leaching losses,” they said, adding that paddocks established on sandy soils were particularly susceptible to high nitrogen leaching losses. Parvage, M.M., B. Ulén, and H. Kirchmann. Are horse paddocks threatening water quality through excess loading of nutrients? J Environ Manage. 2014 Oct 2. pii: S0301-4797(14)00469-1. doi: 10.1016/j.jenvman.2014.09.019.